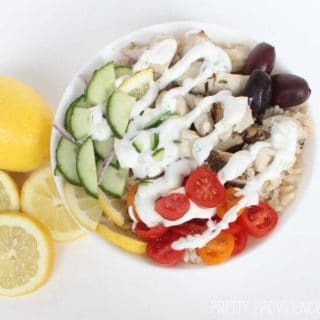 These healthy greek chicken bowls with tzatziki sauce are so delicious. 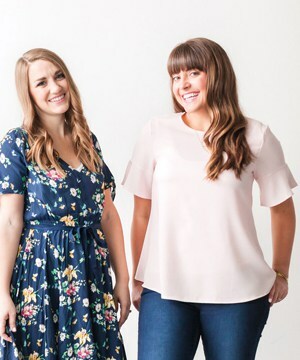 They make eating healthy much easier! Let me introduce you to my favorite new healthy lunch or dinner! This greek chicken bowl is perfect because you can prep everything once and then eat it a few times a week. My favorite kind! I have been enjoying one of these bowls three or four times a week and I’m not sick of it yet! Something about how easy it is to throw together when I’m hungry… it really helps! Also, how beautiful are the ingredients? I love a colorful dish! It just FEELS healthy, fresh and better for you, right?! Combine all ingredients and chill for 20 minutes or longer to let the flavors can meld. Make a batch of lemon brown rice. Grill chicken and let cool. 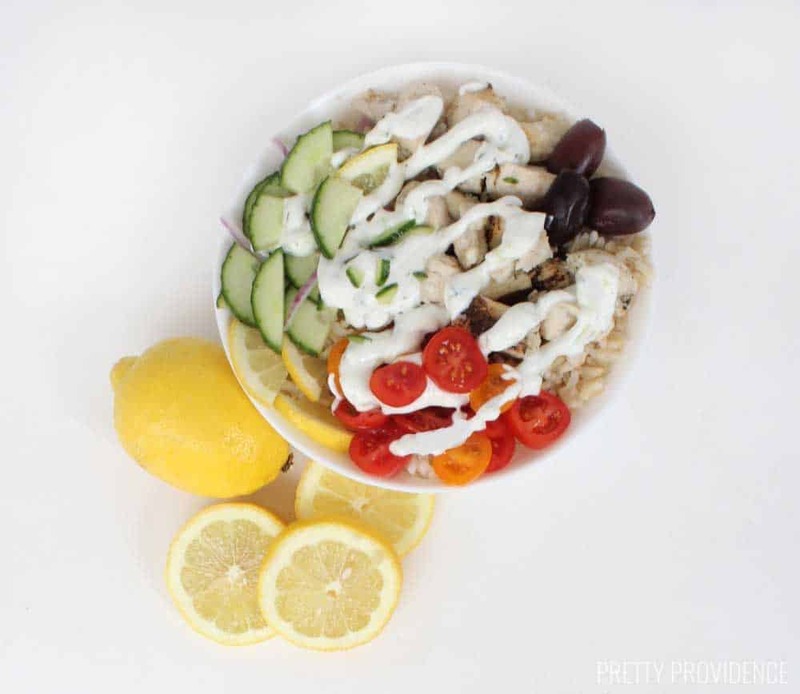 Stir some tzatziki into a bowl with cooled chicken and let sit while you prep the other ingredients. Chop cucumber, cherry tomatoes, red onion and greek olives. 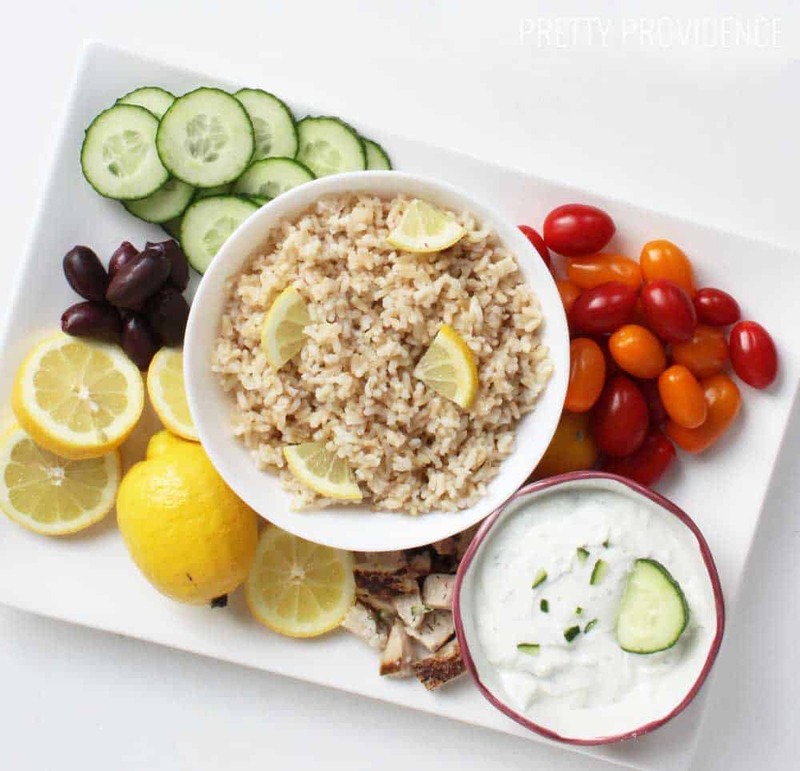 Place toppings over the lemon brown rice, and then add your tzatziki sauce on top of all of it. Enjoy! My mouth may or may not be watering just looking at these pictures. Also, if you love Buffalo sauce and ranch as much as I do, these Healthy Buffalo Chicken Bowls are AMAZING!